The Green Ember is animal fantasy at its best, filled with gripping action and heartwarming rabbits, all deeply informed by the Christian worldview of its author. *The Green Ember by S. D. Smith, illustrated by Zach Franzen. Story Warren Books, 2014. 368 pages. 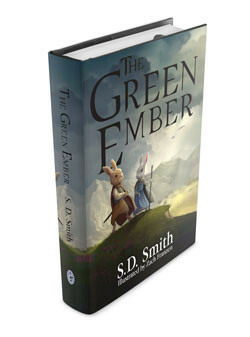 The Green Ember is the story of two young rabbits, Heather and Picket, on the cusp of adulthood. When their home is destroyed by evil wolves and the rest of their family taken hostage, Heather and Picket are pulled into an age-old war between peace-loving rabbits and power-hungry animals of prey (wolves and raptors especially). To rescue their family, they will have to make new alliances in the Mended Wood, learn new skills from mentors, and most of all, find an inner courage they’ve never known before. The Green Ember is described on Smith’s website, Story Warren, as “a new story with an old soul.” With medieval elements like swords, strongholds, and storytellers, the book recalls classics of the genre like The Hobbit. But with more overt Christian themes, cute bunnies, and less stressful scenes of conflict, this book will likely appeal to wider audiences (girls, younger kids) than fantasy series like Brian Jacques’s Redwall. We also reviewed the sequel, Ember Falls. What did Heather and Picket lose when the wolves attacked? How did they prepare to rescue their family? What skills did they need? What moral and spiritual characteristics? How did the rabbits work together to learn new skills and encourage one another? Do you see this in your life? Who is helping you grow and meet the challenges in your life? What role does Christ play? How do you see the Christian worldview at work here? How does the fallen and Mended Wood reflect the Christian idea of fall and redemption? Cover image from TheGreenEmber. A free copy of this book received from the publisher for a fair review. We began by listening to audiobook of the first 5 chapters of book we found on YouTube and are thoroughly enjoying it. The story is engaging and the characters are so well developed that my children are fully empathizing with their story. I am enjoying listening to the story as well. Lovely as a read aloud or perfect for independent reading. Will captivate even the most reluctant reader’s attention. Thanks so much for the feedback, Cheryl. Glad to know this is a hit in your home! BTW, would love a free book so we can continue our read aloud! I am always looking for children’s books that I can recommend to the kids at my church. I wasn’t sure of this book’s content, so THANK YOU so much for making it very clear that this one has a Christian worldview! I will definitely feel free to let them know about it, now!! This looks interesting! I would love the freebie to read aloud to my younger kids. Sorry we neglected to change the notice, Kristina. The giveaway is over. But check back soon, because we’re gearing up for several more big giveaways over the spring leading up to our Summer Reading Challenge. If you have not read any of these yet would you suggest reading The Black Star of Kingston first or third? Erik: I’d say there’s no “right” order for this, and The Chronicles of Narnia is a prime example. As an author works his way through a series, it develops thematically as well as narratively, often in ways that surprise the author. Personally, I found The Magician’s Nephew much richer and more rewarding because I read the books in publication order rather than chronological order. In another case, the earliest Christians were already well-versed in the theology of Christ before the gospels appeared, so they could apply his purpose and identity to the narrative as it unfolded. All that is to say, it’s up to you! But we feel it’s a good rule to read series books in the order they’re published.